In this trading example, there was a clear downtrend. The Fluid expert advisor - which can also detect the trend - opens a series of short positions and closes them in profit. This is an expert advisor that was designed to trade/follow the trend. It can be used for other purposes, but keep in mind that it’s main feature is following and trading with the trend, as well as managing losing trades. Below are more examples of trades opened/managed by the RobotFX Fluid EA from the RobotFX Fluid website. Find your brokers time by seeing it displayed in your trading platform under Market Watch (the top left hand side of your MetaTrader4 platform). Now do a little math to find out the hourly difference betweem the GMT and your brokers time. That is the offset. If the market watch time is ahead of the GMT then your setting is a positive number. But don't use a plus sign. Just write as you normally would for a positive number. If your broker's time is behind the GMT put a negative sign in front of the number. How to trade forex fluid expert advisor for MetaTrader? How to trade forex forex expert advisor for MetaTrader? How to trade forex hedging strategy expert advisor for MetaTrader? How to trade forex metatrader expert advisor for MetaTrader? 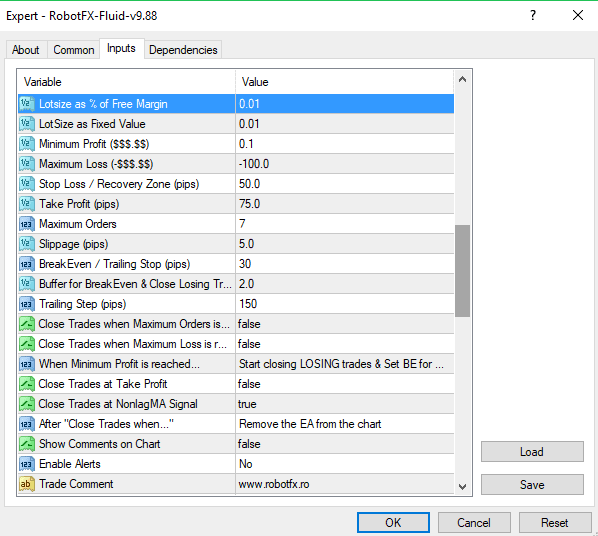 How to trade forex robotfx fluid expert advisor for MetaTrader? How to trade forex trend ea expert advisor for MetaTrader? How to trade forex trend trader expert advisor for MetaTrader? How to use the RobotFX Fluid EA for MT4?